. 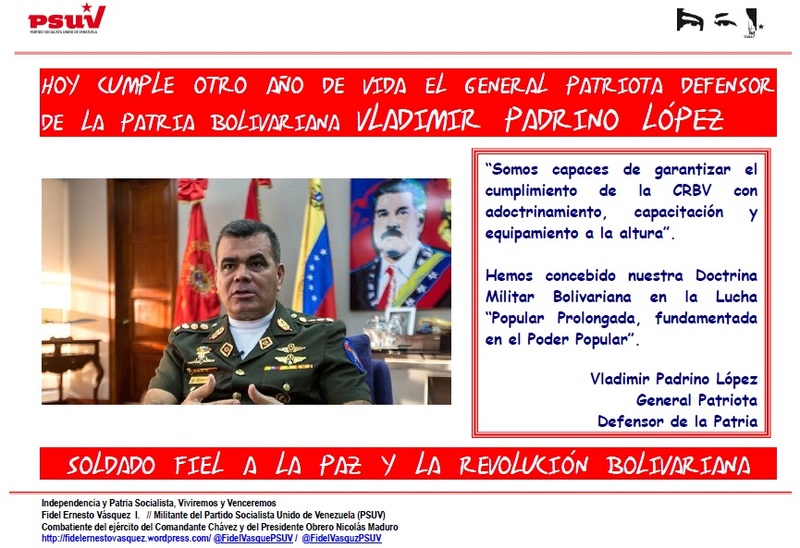 @NicolasMaduro HOY CUMPLE OTRO AÑO DE VIDA EL GENERAL PATRIOTA DEFENSOR DE LA PATRIA BOLIVARIANA .@vladimirpadrino . @CMDTE_CEOFANB « Fidel Ernesto Vásquez I. « . @NicolasMaduro 28 de mayo de 1814 Primera Batalla de Carabobo… HOY LA LUCHA ES LA MISMA: EL PUEBLO CONTRA LA BURGUESÍA Y CON LA UNIÓN CIVICO-MILITAR VENCEREMOS PARA LA PAZ, LA LIBERACIÓN NACIONAL Y EL BIENESTAR DE LA PATRIA. This entry was posted on 30 mayo 2017 a 7:41 AM	and is filed under General. You can follow any responses to this entry through the RSS 2.0 feed. You can leave a response, o trackback from your own site.